we have released a new SMS module for Magento! Mage SMS allows you to send SMS (text messages) to your customers or administrators during various events in your Magento store. Improve customer service & notify customers via SMS to establish greater levels of trust. Deepen the relationship with your customers and build a stronger customer loyalty with the help of SMS marketing. Loyal customers tend to buy more & more regularly. They will also frequently recommend your e-shop to others. More customers = higher sales...! Why use SMS for eCommerce? • Notification via SMS ensures efficient transmission of information and your customers will be informed faster, especially those who do not have permanent access to the internet and e-mails. • SMSs are always delivered to its addressee, opposed to an e-mail which can be considered as SPAM. • Some customers receive dozens of e-mails to their mailbox every day and can therefore easily miss your emails. • SMSs are always read! 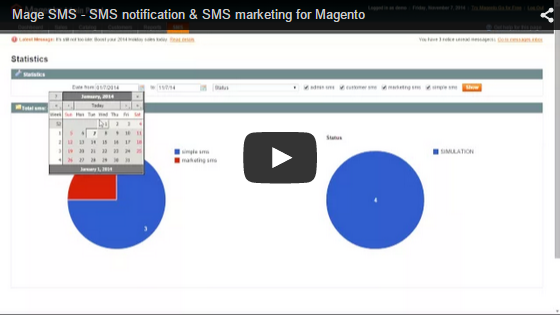 • Send text messages to customers or administrators during various events in your Magento store. System also automatically recognizes your custom order statuses! • Activation/deactivation of all events independently on each other. • Multiple admin support (useful for large online stores with more administrators, who have separate responsibilities). • Possibility to select one or more administrators for each event. • Multiple sender types (Text sender ID, Own mobile number or System number). • Possibility to select different sender type for each country (if available). • Customization of a Text sender ID for each country (11 characters max, which appear in place of the phone number). • Customization of an own mobile number for each country. Mobile phone number validation is required. • SMS marketing with advanced filter options. Sending bulk text messages, similar to a newsletter, enables effective targeting to desired customer groups. This gives you a great tool for running an advertisement campaign, announcing the release of a new product, distributing discount coupon codes etc. • Sending bulk SMS from a CSV file. • SMS opt-out possibility for a customer in the shopping basket. Admin has an option to set whether SMS opt-out will be displayed to a customer in the shopping basket. • SMS charging. Admin has an option to define the price for SMS sending. Price is displayed to a customer in the shopping basket. • SMS history with filters (event, date, recipient, content, delivery statuses, SMS price in credits, total number of SMSs, Sender ID). • History of SMS answers received from customers. • Statistics with filtering options. • Simulation mode allows you to test SMS sending during various events in Magento without actually sending them to recipients. SMS are displayed in SMS history with a special status. • Unicode characters are supported (Unicode allows you to enter characters in all fonts and various symbols simultaneously. Unicode is used for Chinese, Arabic, Greek, Hebrew, Korean, Cyrillic, etc. or diacritic in the text of your SMS message). • Automatic conversion of customer´s mobile number to an international format. • SMS delivery report to an e-mail address. • Credit account management directly from the module (credit account state, low credit alert setting, credit purchase via credit card, bank transfer, PayPal or Skrill). • Automatic update of SMS price list with information in which countries were changed price of SMS. • API for connecting an external application to Mage SMS module (see file api.php in module folder). We have added also three examples of testing scripts (see files api_test.php; api_test2.php; api_test3.php). • STOP SMS (contact us for details). • Do not disturb solution for India (NDNC registry). We provide mobile services for ten years and we use our own SMS solution for sending SMS from the module. SMS solution features an advanced monitoring system and other functions to ensure maximum reliability of SMS messages delivery. including screenshots, demo, SMS pricelist, user manual and option to download SMS module for free. We are looking forward to your comments regarding this module and proposals for improvements! This is support topic for Mage SMS module, if you have any questions or experience any problem with Mage SMS module please feel free to leave a comment here. We will help you as soon as possible. We have released a new Mage SMS module version 1.2.0! If compilation is enabled for your Magento store, after module upgrade it is necessary to run compilation process or the upgrade won´t have any effect! If Compiler Status Enabled, than after the Mage SMS module upgrade click on Run Compilation Process. We have released a new Mage SMS module version 1.3.3! We have released a new Mage SMS module version 1.4.0! - Language mutations in CUSTOMER SMS tab were completely redesigned. Language mutations are no more based on countries but on store languages. So after upgrade please check CUSTOMER SMS tab and configure language mutations of SMS templates according to store languages. - Added possibility to enable SMS sending for certain customer groups only. You can configure it if you click in the main menu of your Magento backoffice on System->Configuration and in the section Magesms click on Mage SMS module and there enable SMS sending for customer groups and select required groups. Mage SMS module utilizes our SMS Portal in order to function. BulkGate will also make everything easier for you. Just see it for yourself! Try a completely new web interface for sending and managing your SMS campaigns. Earn a commission on your happy customers with our SMS affiliate program[/url].